It’s hard to admit that I’m jealous of anything Windows. But I’ve been jealous of the subscreen partitioning feature in Windows 7. It’s really cool. Back in the day, most monitors were small. In most cases, applications were useless unless they were fullscreened. But times have changed. Modern monitors are enormous compared to their predecessors. Unfortunately, Windows users don’t seem to have moved past the fullscreen paradigm1. Keeping several applications simultaneously visible is pretty much more efficient in every way. But most Windows users are too stuck in the fullscreen app paradigm to know any better. Windows 7 is looking to change this. Windows 7 ships with a “snap to subscreen” feature that’s just rad. And it’s really intuitive. Grab a window and drag it to the top of the monitor, and the window will snap to fullscreen. 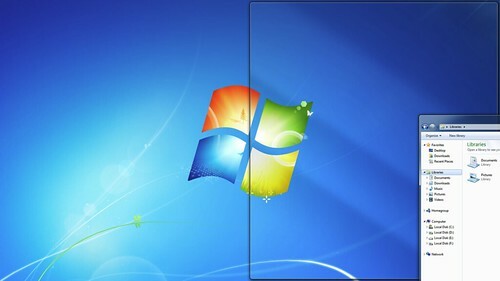 Drag the window to a side and it will snap to a vertical split. This makes it easier to effectively use the monstrous monitors available these days. The implementation is not quite perfect – as of the last time I checked – but it’s a great start. Windows is still pretty crap at using multiple monitors, and snapping windows to a subscreen is no exception. Ideally, a window should be able to snap to the internal divisions between screens, allowing a vertical split on each monitor. Currently it only works on the outermost edges of the outside monitors. The “snap to maximize” is also a bit worthless. True, there are occasions where an app should take up the whole monitor. But a more generally useful case would be a horizontal split, to compliment the available vertical split. Unfortunately the fullscreen is so entrenched in the Windows psyche that this will prob’ly never be fixed. 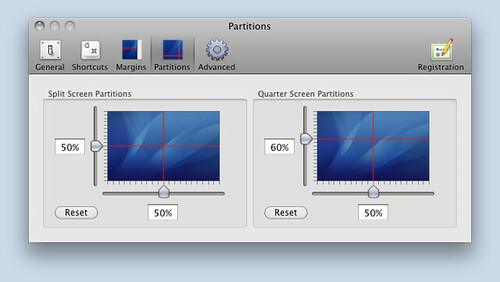 As exciting as this development is, screen partitioning is not enough to convince me to switch back to Windows. So I set out on a quest to find a subscreen window resizer. I’m happy to report that I’ve found it! I’ve been using these two utilities for quite a while – one for at least a year – and they fit the bill perfectly. Cinch, by Irradiated Software, is an amazing implementation of subscreen partitions for OS X. It’s simple, mouse driven, and gives great user feedback. 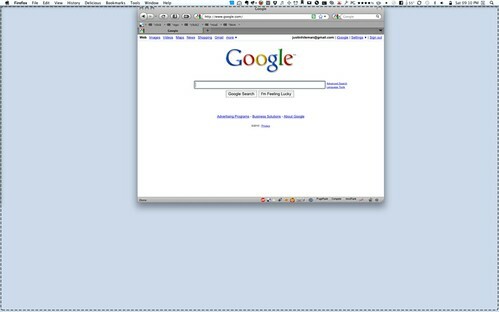 Dragging a window to the left or right edge of the screen will resize the window to fill half the screen. Dragging it to the top of the screen will fill the screen. And dragging a Cinched window away from the edge will snap it right back where it came from. If that sounds a bit confusing, check out the screencast on the product page and it’ll make perfect sense. Unlike the Windows implementation, Cinch can snap to internal divisions between screens. Sometimes it’s a bit tough to hold it at the edge just right to get the window to snap, but the functionality is there. Irradiated suggests making just a bit of a monitor position offset to give you an edge to run the cursor up against, and I’ve found that to work just fine. SizeUp is a handy little app by the same company, and the perfect complement to Cinch. 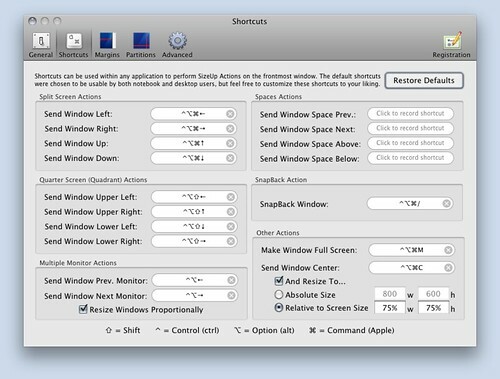 SizeUp lets you quickly reposition windows to fill half, quarter, or full screen via system-wide hotkeys or a menu extra. The hotkeys make tiling, moving and maximizing windows a cinch. Multiple monitor support is seamless in SizeUp. Windows can be easily sent between monitors or Spaces. They even magically resize themselves relative to changes in monitor size. As you can imagine, this feature comes in handy on my desktop box. Unfortunately, SizeUp can’t work perfectly all the time. Some applications enforce a minimum or maximum window size, and some windows don’t resize at all (a la iTunes’ mini controller). When an app just doesn’t want to cooperate, SizeUp does the best it can, putting the windows where you want them and getting them as close to the requested size as possible. Both SizeUp and Cinch are under active development. And really rad. 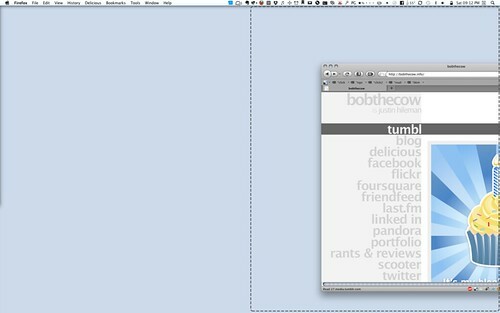 This article was posted 20 March 2010 by Justin Hileman, and is filed under reviews, Mac software, ❤❤❤❤❤, essential, menu extras, The Right Tool and utilities. If you have any comments, please contact me or leave a comment on this article.